Terra Nova Cosmos Tent 2017 - All year round the Cosmos is a superb choice. 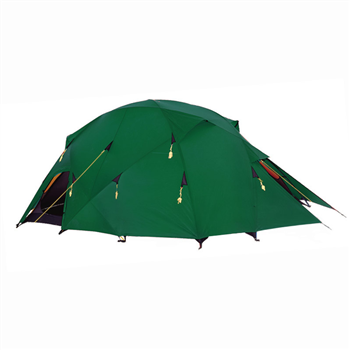 A truly awesome tent, the Cosmos is the ultimate tent for expedition and group use. Watershed fabrics and stable design ensure superb weather protection and durability in the toughest conditions. The geodesic design sleeps 8 in comfort and features 2 porches for access with 2 additional doors allowing entry and exit with out climbing over gear. It's surprisingly easy to pitch with colour coded poles and continuous pole sleeves, easily managed by just two people. A great tip is to have someone inside the tent to lift the poles once they have been sleeved. this makes it easier to locate the pole ends in the eyelets. Great ventilation and you have the option of specifing zipped cook holes in the floor (please contact us before purchase), making the Cosmos perfect for base camp use in hostile environments.